The Japanese studio Gonzo introduced a breakthrough in intercontinental television when it announced that two of their shows would be released online with English subtitles the same night as they premiered on television in Japan. So apparently they got my letters... Gonzo 1, Santa 0. 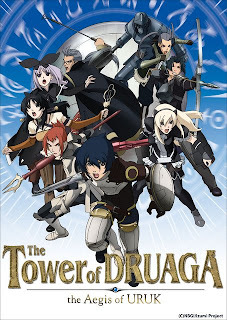 Tower of Druaga can be found (and bought) legally by download or watched on www.crunchyroll.com for fewer than three dollars an episode. Spoiler: it’s worth it! Revolutionary marketing set aside, I found Tower of Druaga to be a magnificent classic high fantasy setting with memorable characters, ground-breaking scenery (gotta put a penny in the pun jar again), and a masterfully told story. This twelve-episode first season now owns my heart, hugging, teasing and scratching it like a middle school relationship. Druaga centers on a land ruled by King Gilgamesh, who, ages ago, scaled the Tower of Druaga, the epitome of evil, and by using every cliché in the book, saved the princess and became king. Problem is that the Tower still stands. Cities live in constant threat of the monsters that pour out of it, and much of the population dedicate themselves to becoming Climbers, adventurers who seek to climb the monstrosity and claim the Blue Crystal Rod on top. Sounds like the set-up to every video game besides Pacman, doesn’t it? It is. In fact, Druaga was made in homage to an 8-bit video game of the same name. Just like in every story, our main character is a bright-eyed, loosely drawn “I-wanna-protect-my-friends-no-matter-what” type named Jil, whose only strength is his physical resilience and unbreakable shield. After being dumped from his powerful yet cold big brother Neeba’s party, Jil gathers a rag-tag band of losers in hopes of scaling the tower and becoming a hero. This is a world filled with classes but no leveling up, magic but no MP. In short, Druaga is a world where the video game is the world. Jil is joined by a dark-haired priestess named Kayaa, her patient powerhouse partner Amrey, the boastful aristocrat mage Melt and his assistant, Coopa, who is the greatest intern of all time. Once their party is assembled, they must compete with Uruk’s national army, a guerilla army of other Climbers, Neeba’s epic gang, and a malicious wind sorcerer. So how did the script writer for Full Metal Panic, the character designer of Burst Angel and the director of Last Exile handle such material? With the tact, charm and humor of true fans. There are dramatic episodes which are well-written and full of pathos, but the true majesty of this series comes from the comedic episodes, which not only make video game references but turn the world into a classic 8-bit parody of the original game! I recommend episode five. That is all you need to know. Do not be scared away by the ridiculous delusion that was the first episode; it’s the greatest parody of action/fantasy anime I have seen this year. Fantasy fans are in for a treat. Cosplayers should start milking this teat before next year’s season two premieres. Anime fans will have a great series to introduce their fantasy friends into anime. Why? Because the script, specifically its humor and ability to transform old jokes rather than rely on stereo-types and repetition. I stand in awe of Coopa’s comedic timing and golem-like strength that never gets addressed seriously. The animation is so pristine, I’d almost accuse Gonzo of putting all their eggs in one basket. Shading and weather effects are gracefully added, though the occasional computer-rendered monsters (Druaga himself, ew) prove distracting. It’s a great climb, full of danger, magic missiles, dragons, knights, wizards, wizard interns, backstabs, and meaningful demises that build up to the single most evil cliffhanger since the first season of Code Geass. Tower of Druaga wins, finds the Master Sword and obtains epic status.